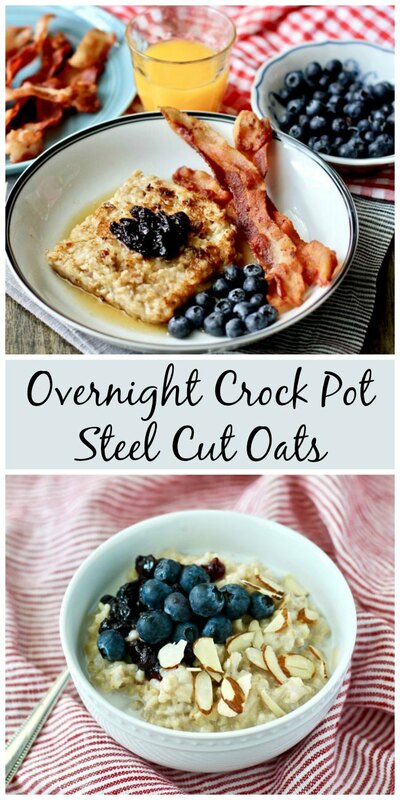 This recipe for Crock Pot overnight steel cut oatmeal is so easy, and it makes the smoothest and creamiest oatmeal with no stirring required. Just top them with your favorite fruit, jam, or other toppings. 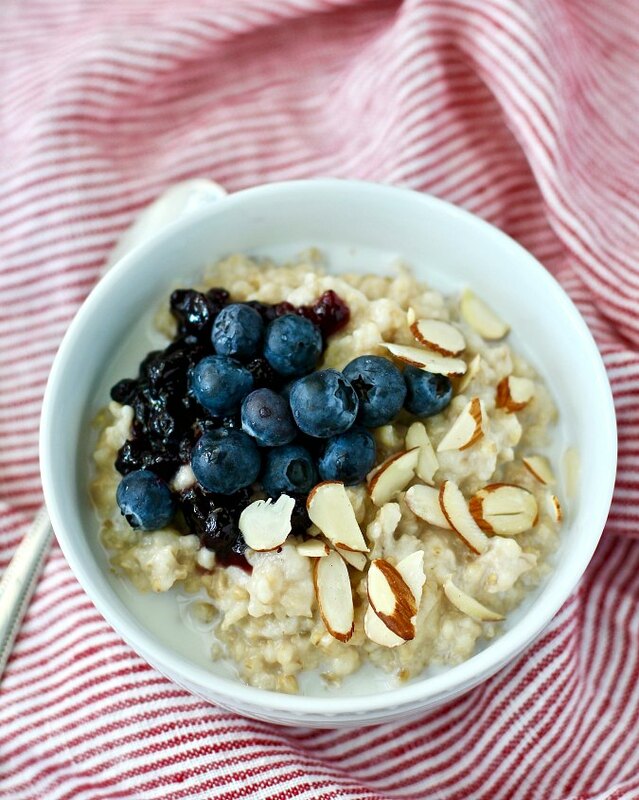 Steel cut oats are whole oats that are cut into smaller pieces rather than "rolled." They are wonderful for a "stick-to-your-ribs" breakfast that will keep you feeling full for hours. They are also loaded with fiber. The negative is that they take longer to cook than rolled oats, up to an hour. Enter the slow cooker! The night before, mix the oats, water, milk, salt, and maple syrup in a slow cooker, set it, and go to bed. In the morning, you will be greeted with breakfast for the entire family. 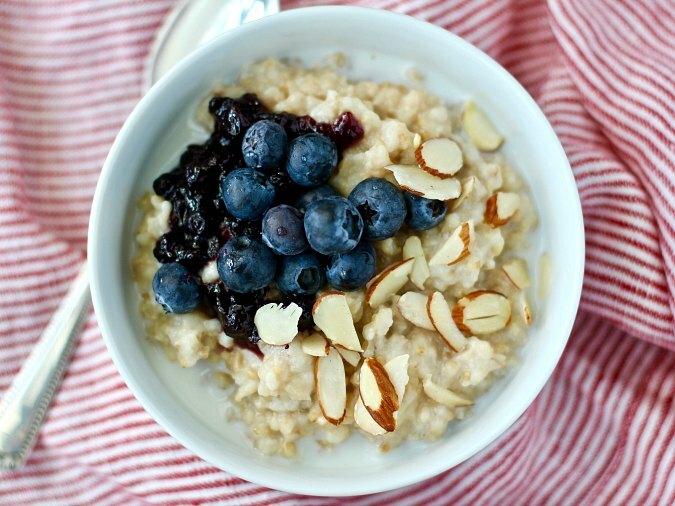 You can leave the oatmeal on warm in the crock pot ready for the early risers and late sleepers in your family. I topped my bowl with a bit of milk, some blueberry jam, blueberries, and sliced almonds. It was so good! What can you fix with leftover oatmeal? This is the best part my friends. Be sure to make a little extra so you can make these oatmeal squares for breakfast the next day and the day after that. Just spread the leftover oatmeal in a 8 inch or 9 inch buttered cake pan, cover, and refrigerate overnight. The next couple of mornings, just cut squares from the cake pan, and pan fry them in butter in a nonstick skillet over medium heat until golden, about 3 minutes per side. I served mine with maple syrup and a dab of blueberry jam. I guess you can call this breakfast double overnight oats.... or overnight overnight oats! The recipe for Crock Pot Oats is for four servings. I used this 3 1/2 quart slow cooker to make them. I've had it for 8 years and still love it (affiliate link). This recipe can be easily doubled or tripled... enough oatmeal for 10 people. To double the recipe, use a 4 to 5 1/2 quart slow cooker, and to triple it, use a 6 to 8 quart slow cooker. This month, the Fantastical Food Fight theme is overnight oats. 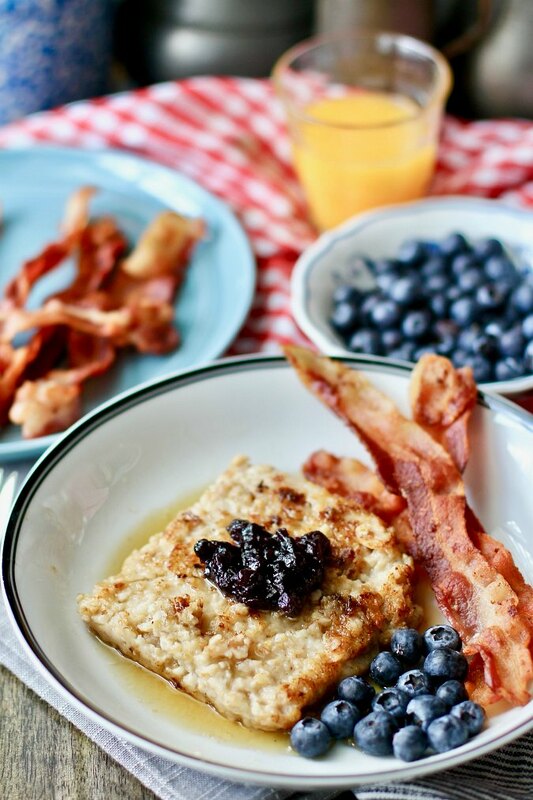 If you love oatmeal, be sure to check out all of the participants' recipes! Inlinkz Link Party You can also make steel cut oats in the Instant Pot. 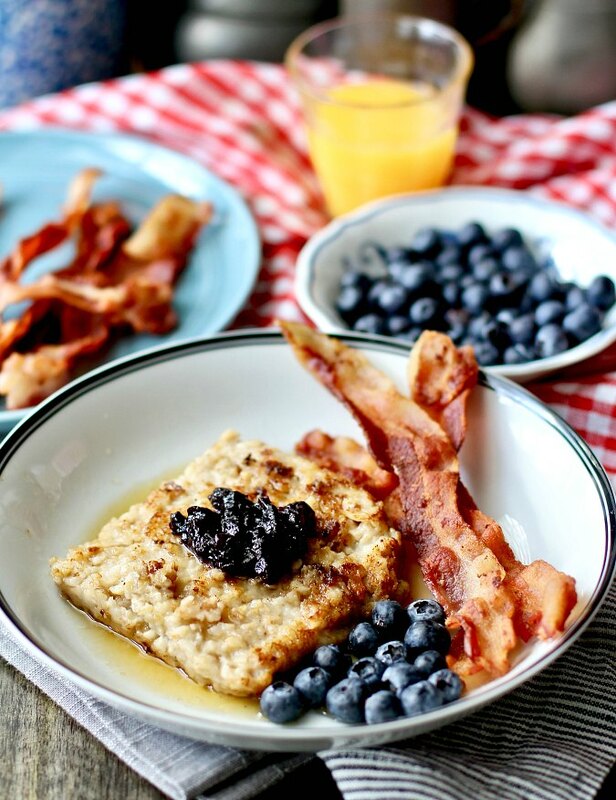 Check out this recipe for Creamy Steel Cut Oats with Apple Raisin Compote. For traditional overnight rolled oats, which are served cold, I love this recipe for Overnight Oats with Honey and Raspberries. Cover and set your slow cooker to cook on low for six hours and then to keep on warm for up to four hours. See note above about saving and preparing leftover steel cut oatmeal. This recipe was adapted from The Great American Slow Cooker Book: 500 Easy Recipes for Every Day and Every Size Machine. Every time you break out your slow cooker, be sure to check out this book. Love the use of the leftovers. Thanks so much for sharing. Thanks Wendy. It was a neat surprise how good the squares were. I love the texture and "chew."